The first time a beginner needs to replace their guitar strings is a daunting experience. With so many different brands and options, you quickly realize there’s a lot to learn about strings. What’s the difference between nickel-plated steel strings and pure nickel strings? What does .010 mean and why do some strings have coatings on them? Do I need heavy or light gauge strings? What is hex core and does it matter? In this guide, I will cover everything you would want to know about electric guitar strings. The goal of this guide is to make you an expert in guitar strings. I’ll give you tips and advice to help you figure out what are the best guitar strings for you. At the end of this guide, I have a guitar string FAQ section answering the most common questions about guitar strings. What Is Guitar String Gauge? The most important factor to know when picking a set of strings is the string gauge. Let’s look at what gauge means and why it matters. The gauge of a guitar string is the thickness of the string. Guitar string thickness is measured in thousands of an inch. The thicker the guitar string, the heavier the gauge. Light gauge strings are thinner than heavy gauge strings. 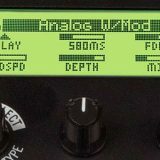 The above pack of strings is one of the most common gauges available. On the left side of the pack, you will see six numbers: 10 13 17 26 36 46. These six numbers refer to the thickness of each string starting from the high E string. The number ’10’ means the high E string has a thickness of 0.010 inches. We just say “10” for simplicity instead of saying “point zero one zero”. You’ll also notice the number ’10|46′ on the top right of the pack. This is a short way of writing the string gauges. It means the high E string uses a 10 and the low E string uses a 46. If you wanted to ask for a pack of strings in this gauge at a guitar shop, you can ask for it in different ways. You could ask for “a pack of 10s” or “a pack of 10 to 46”. When you hear guitarists talk about 9s, 10s, 11s, it means guitar strings that start with a high E string with a gauge of 0.009, 0.010, 0.011, etc. You might notice the pack also says “Regular Light Gauge”. Most guitarists call 10s regular gauge. Different brands may use different labels for their gauges, so it’s best to talk about the gauge numbers instead of labels like light, super-light, heavy, regular, regular-light, etc. Typical sets try to keep the tension similar across all strings. That means when you play a bend on a high E string, it will feel similar to the tension you feel on a bend on the low E string. But it’s possible to mix a set of strings to have different tension across the strings. Some guitarists like to use light gauge strings on the top three strings (G B E), then use heavier gauge strings on the lower strings (E A D). There are packs available with this mixing of gauges, often called ‘light-top heavy-bottom’. This means you get nice tight tension when play rhythm parts or riffs, and lighter tension for solos. Some guitarists buy individual strings so they can create a custom set with the exact gauge they want on each string. I recommend starting with normal packs of strings before you start experimenting with mixing gauges. What Guitar String Gauge Should I Use? The type of string gauge you use makes a massive difference in how your guitar feels to play. While string gauge does impact tone in a very minor way, it makes a huge difference in playability. Even changing from a pack of 10s to a pack of 11s can feel very different. The heavier the string gauge, the more tension the string holds. If you like the feel of light and looser strings, you should use lighter gauge strings. If you like the feel of tighter strings, use heavier gauge strings. Tension makes a big difference to playability. Let’s say you’re a blues player and use a lot of bends and wide vibrato. It will be easier to perform bends and vibrato with lighter gauge strings. Lighter strings will give you more control over your bends and vibrato. While some blues players like Stevie Ray Vaughan use heavy gauge strings, many prefer lighter strings. Heavier gauge strings are great for guitarists who prefer the tight feeling of strings. If you’re a heavy riffer or strum the strings hard, heavier gauge strings may feel better. They’ll also keep in better tune as you hit the strings hard. Pick or strum the strings hard – Heavier gauge strings are more stable and prevent out-of-tune playing. They also break less often than lighter strings. Use lower tunings – if you tune your guitar down (eg: Drop C), heavier gauge strings will compensate for the lower tuning and keep the strings tight. Play Jazz – Jazz players don’t tend to perform bends and prefer the feel of heavier gauge strings. Play Metal/Rock/Punk – heavier gauge strings work really well for rhythm players of hard or heavy styles of music. Have very low string action – heavier gauge strings can prevent a lot of fret buzzing thanks to the higher tension. Want more sustain – heavier strings tend to produce more sustain and volume. Are a beginner – lighter gauge strings are easier on the fingers and will make your learning process easier. Play a lot of lead work with bends or vibrato – the lighter strings make it easier to bend and control the strings. Like the feeling of looser strings – if you feel like you’re always fighting against your strings, drop the gauge down to something lighter. Keep in mind that guitar strings come in a full range from super-light gauge to super-heavy gauge. So if you may find the best gauge for you is in one of the extremes (eg: super-light) or somewhere in the middle (eg: regular). Tip: the best way to figure out what guitar string gauge is right for you is to experiment with some different string sets. Buy a pack of 9s, 10s, and 11s and try playing each set for a couple of weeks before changing. You’ll notice a massive difference when you change sets and you’ll quickly learn whether you prefer heavier or lighter gauge strings. You can keep experimenting with lighter or heavier gauges (eg: 7s or 13s), but start with 9s, 10s, and 11s as they’re the most popular. The right guitar string gauge for you is the one that you enjoy playing the most. Don’t try and struggle with a super-heavy gauge just because your idol uses them. Find what feels the best to you. While guitar string gauge plays a huge role in playability, the metal used in the strings plays a big role in tone. Let’s look at the metals used for electric guitar strings (acoustic and classical strings will be covered in another guide) and what to expect from each type of metal. The most common metals used in guitar strings are Stainless Steel, Nickel, and Nickel-Plated Steel. Other less common metals used are: Cobalt, Titanium, and Chrome. 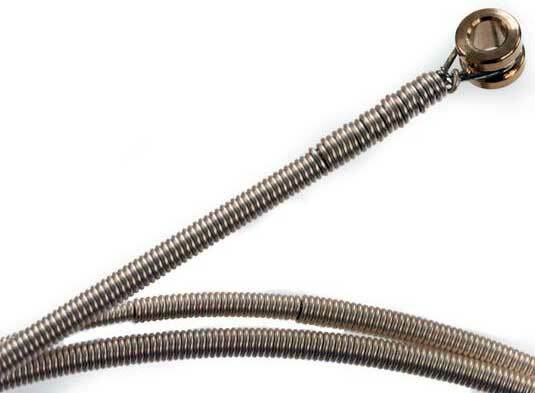 Stainless Steel strings are very resistant to corrosion and produce a very bright or crisp tone. They also produce more volume and sustain. Pure Nickel strings are very warm sounding and are often used for vintage-style music such as early rock and blues. Nickel-Plated Steel Strings have a good balance between brightness and warmth as you would expect from these two metals. 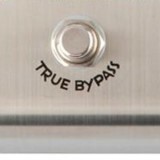 This is the most popular option guitarists choose. Chrome strings are very warm with less resonance. They’re often used by Jazz guitarists. Cobalt strings are very sweat and moisture resistant and offer a brighter tone. They also feel very nice under the fingers. 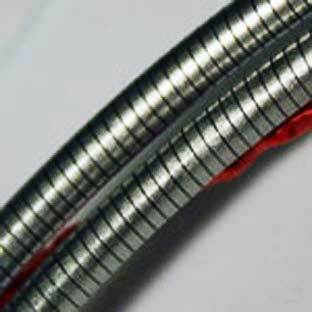 Titanium strings a slightly bright tone and very durable. Not very common. Tip: If you’re not sure what metal strings to buy, I recommend buying three packs from the same brand and compare the three most popular options: Stainless Steel, Pure Nickel, and Nickel-Plated Steel. Try each set out for a week, then switch so you can compare them. Don’t take too long between sets or you won’t be able to properly compare them (remember that the sound of strings change over time). Once you know what type of metal you prefer out of these basic choices, you can try comparing your top choice against other metals, alloys, or strings with coatings. Roundwound guitar strings are the most common on electric guitars. You may go through your entire life only seeing roundwound strings on a guitar (unless you play certain styles of music) and many guitarists don’t even know other types exist. The rounded edges are why guitar strings make noises when you run your fingers up and down them. On the lower strings (and on bass guitar strings), you can feel the rounded bumps as you move your fingers on the strings. Roundwound strings are bright and are suitable for most styles of music. They’re easy to grip to which makes bends and vibrato easier. Roundwound guitar strings are significantly cheaper than other types, so unless you’re happy selling out over double or triple the price for some flatwound strings, you probably want to stick to roundwound strings. Flatwound guitar strings have a flat edge running along the string. Other stringed instruments such as the violin and cello use flatwound strings as they produce less string noise and have a warmer or more mellow tone. The smooth edge of the string means you get less string noise, are able to slide around easier, and can produce a smoother tone. The downside is that the flat edge makes it harder to grip the string. This makes it difficult to play bends and wide vibrato. Bends on flatwound strings will feel strange to many guitarists, enough for them to stay away from flatwounds. Flatwound guitar strings are popular with jazz and some blues guitarists for the mellow tone they produce. Bass guitarists often use flatwound strings for the silky smooth feeling they offer. 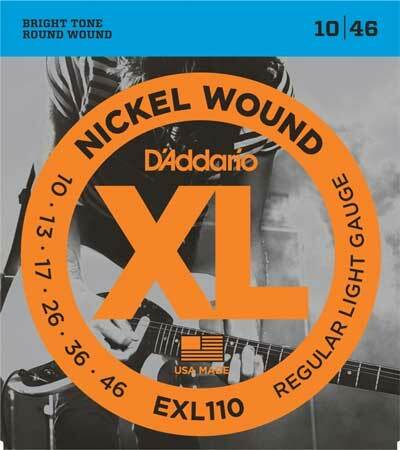 Half Round (sometimes called groundwounds) guitar strings are far less common than flatwound strings. The manufacturer starts with a roundwound string, then grounds the edge down until it’s almost flat. The result is a flatter edge, but it’s not completely flat. Think of these strings as the mid-point between roundwound and flatwound. You get benefits of less finger noise while playing and sometimes a smoother feel, but you still get some brightness in tone. These type of strings are common on bass guitars but rare on electric guitars. They’re also very expensive, so they appeal to a very limited number of guitarists. If you’ve never tried playing on flatwound guitar strings before, you might be shocked by how alien they can feel. Depending on your playing style, you might love them and convert to using them all the time, or you’ll instantly hate them. While they are far more expensive than roundwound strings, I recommend buying a set so you can at least try them out. The different feeling may give you some inspiration or take your playing in a new direction. I have one guitar set up with flatwound strings just so I can play around with them when I feel like it. Unless you’re a jazz guitarist or you want to experiment with something a little bit different, I recommend sticking to roundwound strings. Now that we’ve looked at the ways guitar strings are wound, let’s look at the what they’re wound around. You might not be able to touch the core of a wound string, but it does play an important role for playability. There are two types of guitar string cores: round core and hex core. 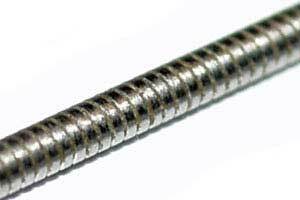 Hex cores are made from a six-sided wire strand, while round cores are round. Hex cores are the most popular type today. 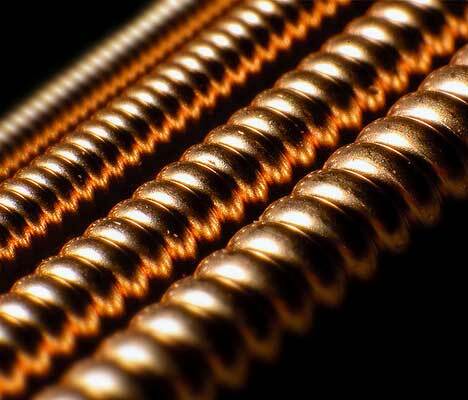 Guitar strings used to all have round cores. The downside of round cores is that the core doesn’t provide any grip to the windings, which cause them to slip. This causes tuning issues and they can break more easily. 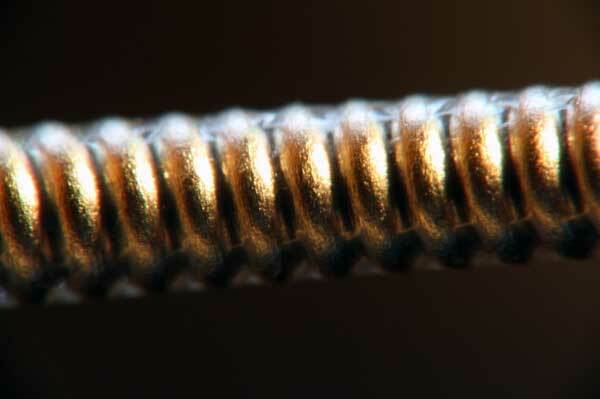 The above photo shows a normal roundwound guitar string with a hex core. You can even see some buildup of gunk on the string (covered later). Hex Cores were first created by D’Addario and are the most common type you will see today. The main benefit of hex cores is that the edges give the windings something to grip on to. This means you get better tuning stability and the string winding is less likely to slip over time and break apart. 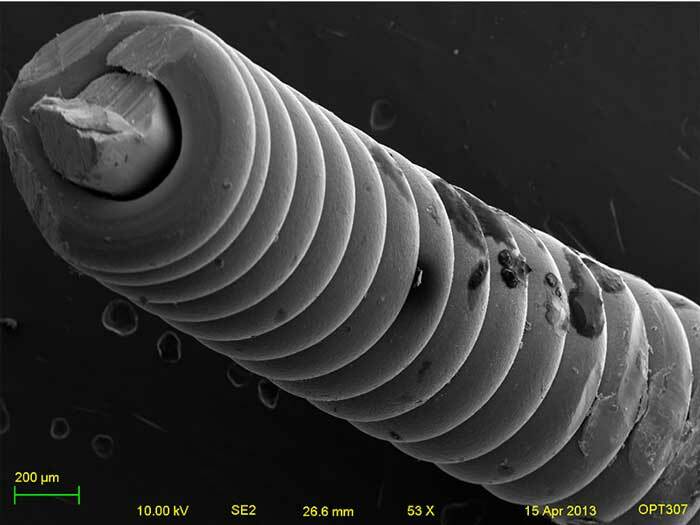 As you saw in the above microscopic photo, gunk quickly builds up in roundwound guitar strings. Skin particles, dirt, and oil will build up on your strings as you play them. This causes your strings to become dull-sounding and shortens their lifespan. One way to combat this gunk buildup is to use coated strings. Coated strings use a thin polymer film to completely cover the strings and prevent dirt and particles from getting trapped between the string windings. In the above photo, you can see how the coating protects the gaps between each winding. Dirt and skin particles can’t work their way into the windings thanks to the coating. The big benefit of the coating is that the strings last far longer than uncoated strings. Dirt and gunk don’t degrade the strings, so they keep their vibrancy for a lot longer. The other big benefit is with how the strings feel. The coating smooths out the string which reduces string noise and makes the string feel better to play. When coated strings first came out, there was an obvious difference compared to uncoated strings. You could hear a big tone difference and the coating would quickly wear out and flaked all over the guitar. Fortunately, coating technology has improved and now there is very little difference in tone between coated and uncoated strings. The coating is so thin (but very durable) that it has a negligble impact on tone. If you’ve never tried coated strings before, I highly recommend getting a pack and seeing what all the fuss is about. You may find you prefer uncoated strings, or you may decide that you want to permanently change to coated strings. While there are quite a few brands that coat their strings, I recommend starting out with a pack of coated strings from Elixir. Elixir have excellent experience with coated strings and produce three different types of coatings for electric guitar strings: polyweb, nanoweb, and optiweb. Optiweb coating was designed to feel and sound as close as possible to uncoated strings. They use an incredibly thin coating, which means dirt can still get trapped in the gaps between the windings. The string is still protected from oils and grime, but the thin coating doesn’t do as good a job of preventing buildup. 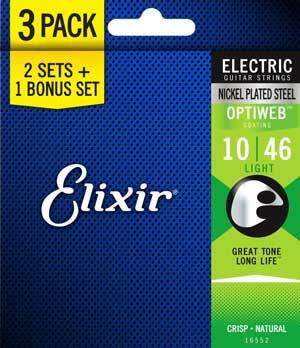 Grab yourself a pack of Elixir Optiweb strings here to give them a go. Nanoweb coating is much thinner than polyweb coating, but thicker than optiweb coating. This is a good middleground between Elixir’s three options. You get a smoother string feel than optiweb coating, but the tone isn’t impacted by the coating as much as it is with polyweb coating. 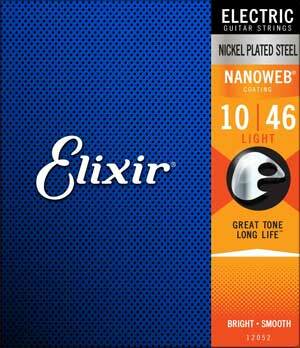 Grab yourself a pack of Elixir Nanoweb strings here to give them a go. Polyweb coating protects the gaps between windings as the coating isn’t as thin as the other two options. This creates a much smoother string to play on, and completely prevents grime from working it’s way between the windings. 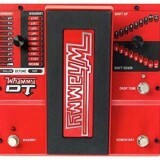 The downside is it does impact the tone compared to the other two options. Grab yourself a pack of Elixir Polyweb strings here to give them a go. If you only want to get one pack, I suggest trying the Polyweb strings. They will make it obvious how coated strings are different to uncoated strings. Then you can decide whether you want to try one of the other coatings or not. Elixir have a great tool on their website that lets you hear the different types of coatings and how they compare to uncoated strings. It’s a quick way to compare the differnet options. Check it out on the Elixir website here. An important point to keep in mind with this tool is that it only compares the sound of brand new strings. The real benefit with coated strings is the extended life, which you won’t hear in the examples. Buy strings in bulk: once you find a set of strings you really like, buy them in bulk. You’re going to constantly go through strings, so you may as well save as much money as possible from bulk discounts. It’s also really handy to always have a spare on hand. Experiment with different string gauges: a lot of guitarists have never tried different string gauges. 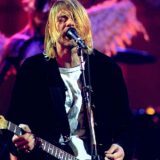 Some guitarists made their decision on what gauge strings to use based on what their idol was using. The right strings for you probably won’t be the same as what your idol uses. How do you know you’re using the perfect gauge strings for you if you never try anything different? Try a heavier or lighter gauge set and see how they feel. Wipe your strings down after each session: have a rag near your guitar and quickly wipe the strings down after you play it to remove dirt, oil, and gunk from building up. While you won’t be able to prevent all grime from building up, it will make a difference to your tone and string life. Clean strings also feel nicer to play. Don’t become obsessed with brands: remember that famous guitarists rave about particular brands because they’re endorsed by those brands. Nobody is paying you to stick to one brand of strings, so consider trying other brands. You might find you prefer what you normally use, or you might find a different brand produces better strings than what you normally use. What guitar strings should a beginner use? Beginners should start with lighter gauge strings to make it easier on their fingers. A common complaint beginners have with learning guitar is finger pain. Until a beginner’s fingertips toughen up, learning to perform a bend or form a barre chord can be hard. Lighter gauge strings allow beginners to develop faster and practice more often without experiencing finger pain. A set of 9s or 8s will be far more comfortable for a beginner compared to ‘standard’ 10 gauge strings. Why are guitar strings different thicknesses? The lower pitched strings on a guitar are far thicker than the higher pitched strings. This is so the tension across all strings can be consistent. If all the strings were the same thickness, the low pitched strings would be slack, while the high pitched strings would be extremely tight. Using different thickness across the strings gives each string an even tension. This is also why guitarists who tune down their guitars use heavier gauge strings. Thicker strings allow you to tune lower and keep the same tension. It’s also why 7 or 8 string guitars have much thicker strings on the 7th or 8th string. How long a guitar string lasts depends on how often you play, whether you keep your strings clean, and the type of string. Some guitarists need to change their strings every week, while others can keep the same strings for months without needing to change them. As you play, dirt and oil degrade your strings and make them sound dull. This means the more you play, the quicker your strings will degrade. Wiping your strings down after each practice session can lengthen string life. If you want the longest life strings possible, get a set of coated guitar strings. As explained earlier, the coating prevents dirt and grime from building up on the strings. How does guitar string gauge affect tone? The gauge of a guitar string affects tone in a very minor way. Thicker guitar strings have more sustain and a fuller tone due to the increased tension. Thinner guitar strings have less sustain and a slightly thinner tone. While string gauge does affect tone, it’s the least important quality of the string. The type of metal, core, and coating plays a far greater role in tone than the string gauge. Are thicker guitar strings better? There is no perfect string thickness. Thicker strings are better for some guitarists such as heavy rhythm players, while thinner strings are generally better for lead guitarists. Every guitarist has different preferences when it comes to string thickness, so there is no best thickness. If you like the feel of tight strings, then thicker strings will be better for you. If you like looser feeling strings, lower gauge strings will be better for you. What is the thing at the end of a guitar string called? The thing at the end of a guitar string is called a ball end. The ball end is a metal loop the string wraps around. This is used to hold the string in place in the bridge of the guitar. They’re used on electric guitar strings and steel-string acoustic strings. Nylon string guitars don’t use them as the strings are tied to the bridge. How do I choose guitar strings? Read through the above information in this guide and think about what’s important to you in the above three choices. Why are my guitar strings hard to press? If you find it hard to press down on your guitar strings, it means one of two things. Either your fingers haven’t built up enough strength, or you’re using a heavy gauge string. Getting a lighter gauge string will make it easier to press down on the strings. As you practice more and more, your fingers will get stronger and you’ll find it easier to press down on your strings. Are guitar strings supposed to be tight? The tension on guitar strings is all about personal preference. Some guitarists like really tight strings while others like looser strings. If your strings are so tight that they cause you pain or you struggle to play, then you should replace them with lighter gauge strings. If your strings feel loose and you hear buzzing noises when you strum the strings, it’s a sign that the guitar isn’t set up properly or the strings you’re using are too thin. Putting heavier gauge strings on your guitar will increase the tension and prevent buzzing noises.